Seagate Ironwolf NAS Hard drive - 6 TB, still has warranty remaining! Immediate payment of C $179.99 is required. I own two previous Seagate externals, one of which is almost a decade old and still works like new. I use them everyday, so they've proven to be extremely reliable. Solid brand. 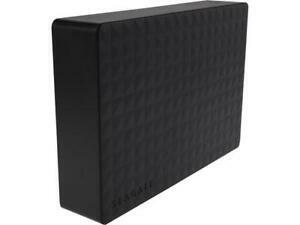 As for this drive, I've never owned such a large capacity HD like this one but I trust Seagate's quality. The drive is small and runs quietly. I haven't yet noticed any alarming increases in it's temperature either, after it's been running for several hours and transferring hundreds of gigs of data onto it. The data transfer rate is okay (30-50mb/s) but large transfers understandably can take longer. Data transfer rate can be significantly increased (I've seen up to around 130-150mb/s) if you configure the drive's policy and enable write caching but I don't bother, nor is it recommended. All in all, it does it's job well. I'm satisfied. Even if I generally don't buy Seagate hard drive anymore (they don't last as western digital does) I got this one cause it was a very good price for lots of terabytes. I'm only using it to store things I don't use regularly so its OK. The item is silent enough and the case looks nice too! Hopefully this time it will last!!! My first 8TB external Drive .. when is starts up you can hear it spin and it Vibrates, Standing on it's side , thats where the Rubber feet are located. I Preffer if they supplied spare Rubber tabs so I can lay it flat, Easy to tip over and Head Slap Drive toast ..Got those Felt pads you use for chairs and the noise is Quieter. The one I received is very quiet . Fast transfers and loads of capacity. Great drive but bad enclusure. Drive size for the price is a fantastic deal, but I had to take my drive out of the case and install it in the computer directly because it was running 60C in the stock enclosure under heavy writing, way too hot for any kind of drive longevity. In the computer the drive maxed out at 45C under heavy writing, which is still a bit warm but acceptable.